Want to have a personalized table cover for your next event? 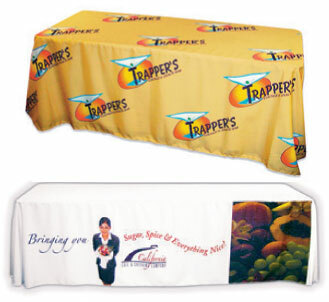 With our full color table covers there are no limits to what you can have- images, graphics, logos and text! All full color table covers are printed on our poplin material. This material is fire rated and machine washable. We offer a few different sizes for full color table covers. Wash in cold water on the gentle cycle. Air dry the table covers first. If needed, tumble dry on low to get rid of any wrinkles in the material.